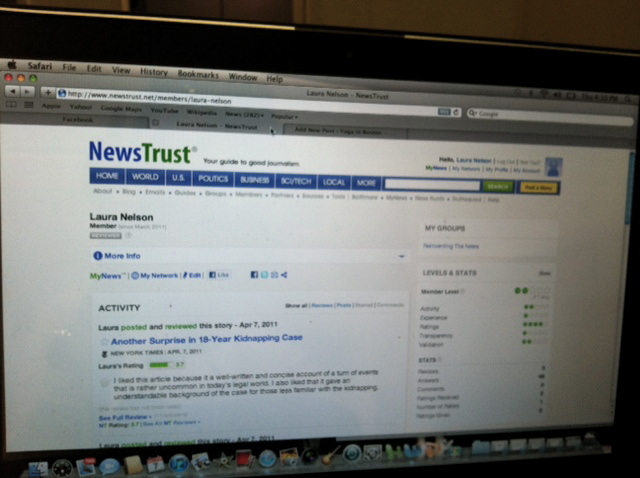 For a class assignment, I’ve been instructed to delve into the wonderful world of NewsTrust. Since “news” and “trust” aren’t always two peas in the same pod, NewsTrust.net attempts to make it easier for the news consumer to weed through good and not-so-good journalism. Basically, you can surf through stories from all different media outlets and see what other members of the NewsTrust community (anyone who signs up for the website) has to say about them. Reviews can be made in long or short form, allowing a visitor to go as in-depth as necessary in order to frame an accurate picture of how trustworthy they found the article in question. If you’re interested in rating articles as well, you can simply and easily create an account and get right to rating! After making my own account, I rated three stories that others had posted and added two stories I found on my own which I proceeded to rate as well. By selecting the “full review” method of rating for each story, I was asked to specify whether or not I found each story to be insightful, relevant, well-written, and a host of other qualities that would constitute a quality piece of journalism. I was able to submit stories that were of interest to me, and as time goes on, I am hoping for others to review those stories and see how my reflection compares to other visitors of NewsTrust. While I do have my own opinions on what I read, I find it incredibly beneficial to hear what others think of stories I’ve either taken a liking to, or been less interested in. I find that a little bit of insight from someone in one direction or the other can often expand or alter my view on something, which is why I think NewsTrust can be a great forum for journalists and news hounds to discuss their opinions.